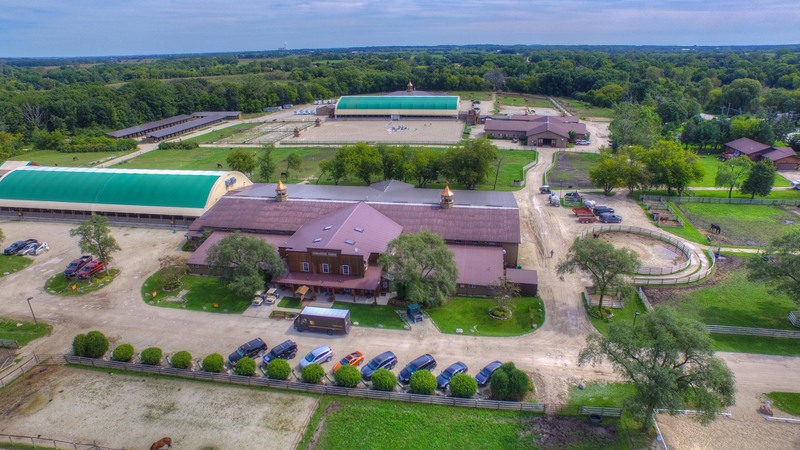 BRISTOL, WI--(Marketwired - October 21, 2015) - The 168 acre, state of the art horse training facility, Sunflower Farms, located near the Illinois-Wisconsin border, will be auctioned in four properties on Thursday, October 29, at 11:00 a.m. CST announced J.P. King Auction Company. The absolute auction with no minimums and no reserves will be held at the Welcome Center on Sunflower Farms. The seller is Robert W. Troch, Jr., Chairman of the Board of Bell Fuels, Inc., one of the largest privately owned distributors of fuel products in the Chicago-metropolitan area. George Sweeney, President of Bell Fuels, said, "Bob Troch has gone to great effort to maintain Sunflower Farms and gain the favorable opinion of the equestrian community. 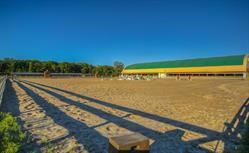 Sunflower Farms is a stunning lakefront setting. As you drive toward the Welcome Center, you begin to sense the scale of the 168 acre farm that is incredibly well maintained." The four parcels may be purchased individually, in any combination, or as an entirety. 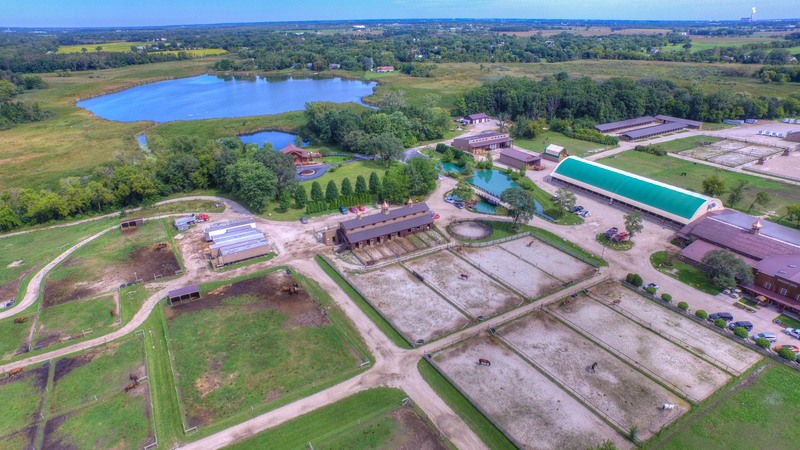 Parcel 1 is focused on hunter and jumper training and includes four (4) barns with a total of 86 stalls, an arena, tack shop, woodworking shop, and two homes. 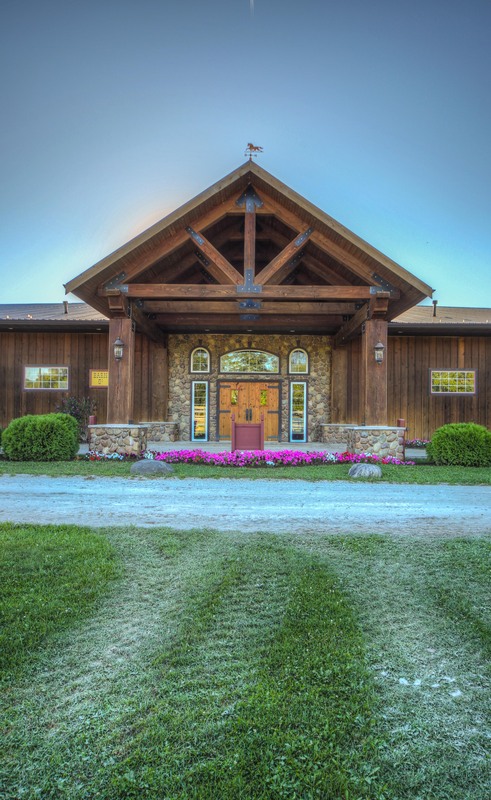 Parcel 2 is focused on dressage training and includes the Welcome Center with a main office, a premier log home containing three (3) bedrooms and (3) three baths, four (4) barns with a total of 65 stalls, two arenas, and a machine shop. Parcel 3 is approximately 64 acres with a three (3) bedroom, five (5) bath house, acres of fenced pasture land, and two storage trailers. Parcel 4 is approximately 40 acres zoned for both commercial and agricultural use. 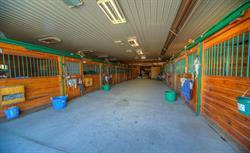 "Sunflower Farms is an active equestrian community. Borders come up from Chicago and down from Milwaukee all 12 months of the year," said Phil May, Operating Manager, Sunflower Farms. This very special equestrian facility for hunting, jumping and dressage, is a master planned system of arenas, paddocks, and scenic paths which combine to allow the rider to focus on the thrill of achievement and the pure joy of riding. With "Equestrian Excellence by Design," as its motto, it is the only horse-care facility of its kind in the area. J.P. King Auction Company is conducting the auction. Property tours are available beginning October 20, through auction day. To schedule a personal tour of the property, call the Auction Information Center at 800-558-5464. Also, for additional information on Sunflower Farms, visit the J.P. King website at www.jpking.com. The Welcome Center houses the farm's main office and includes two stories, with the upper level finished as a meeting or reception area. 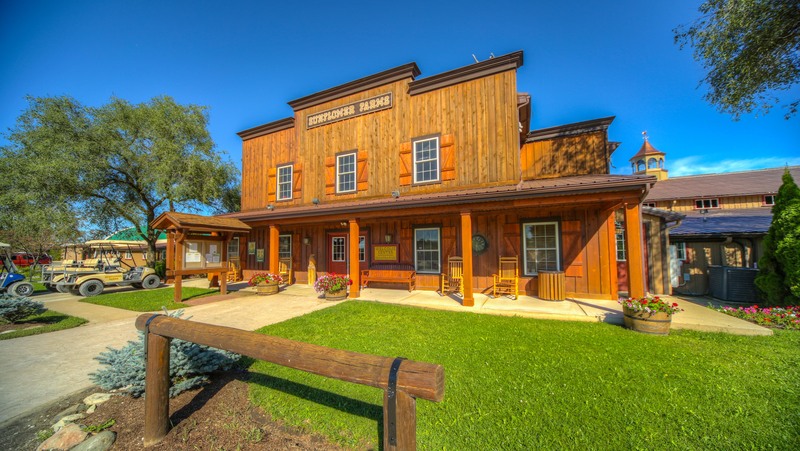 Sunflower Farms spans 168+/- acres with eight high-end barns, four beautiful homes, a welcome center, indoor and outdoor arenas, a saddle shop, and much more. 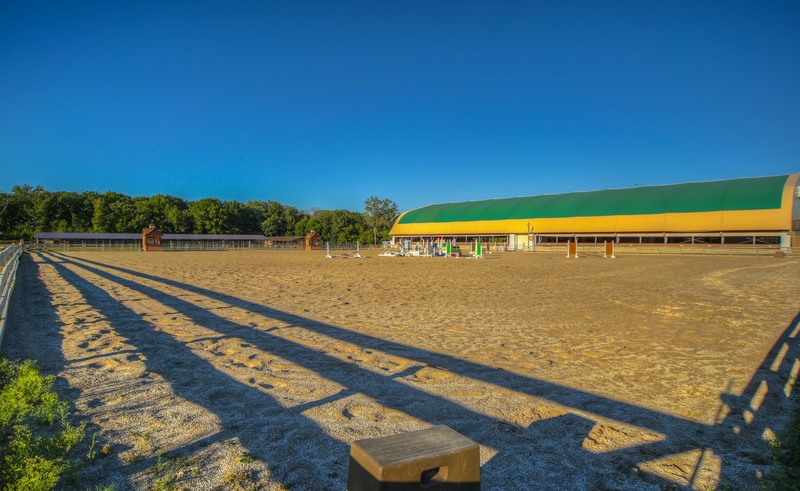 The 168 acre, state of the art horse training facility, Sunflower Farms, is located on a stunning lakefront setting. Barn G includes 42 stalls and a two-story ceiling allowing unrivaled air circulation, providing the ability to stay cool in the summer and warm yet airy in the winter. A boarder lounge, kitchen area, individual lockers, six grooming bays, and two wash racks give this barn the highest level of comfort and luxury. 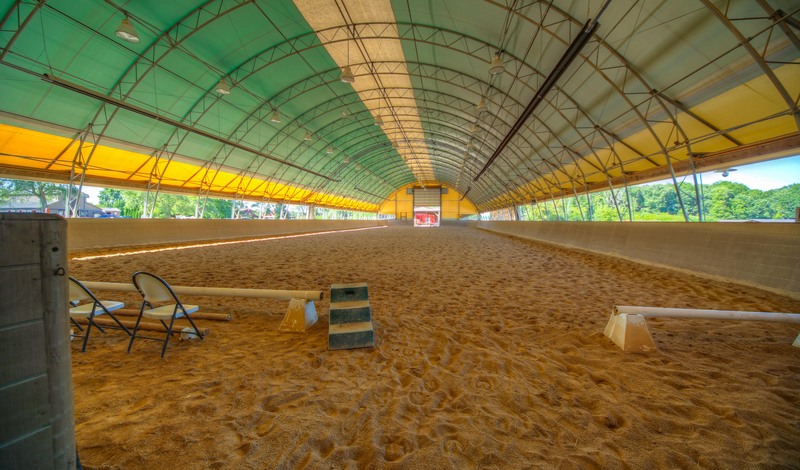 The indoor, Cover-All arena is heated and used for hunter/jumper training. The outdoor arena. With "Equestrian Excellence by Design," as its motto, Sunflower Farms is the only horse-care facility of its kind in the area. Sunflower Farms includes 150 stalls, which are currently 80% occupied. 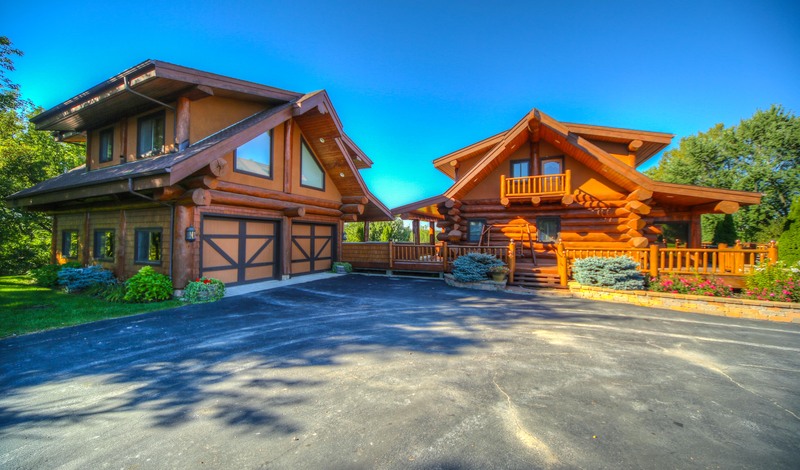 Log homes at Sunflower Farms. This equestrian facility for hunting, jumping and dressage, is a master planned system. 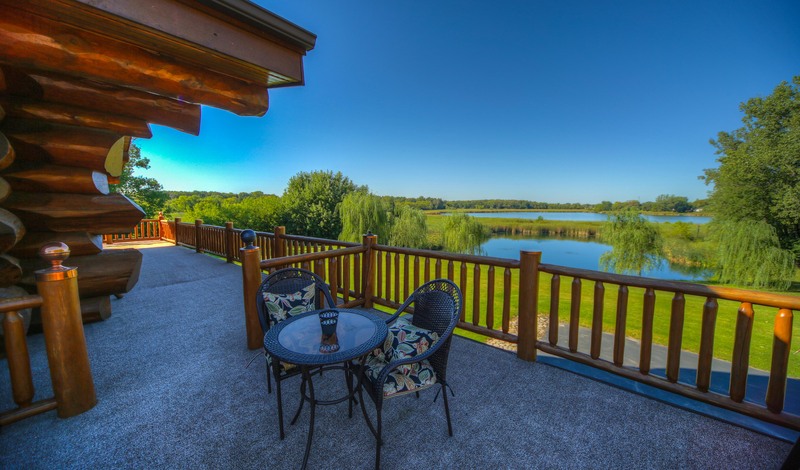 View from the deck of one of the Sunflower Farms log homes.